The role of medical research is of huge importance to the Raynuad’s and scleroderma patient, and to the rare disease patient, in general. 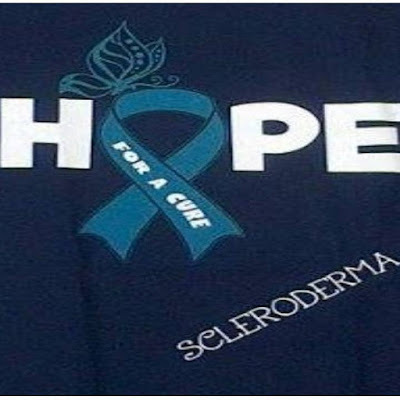 There is currently no cure for scleroderma, as well as, the causative mechanisms still remain a mystery, albeit, the understanding of the cause and cure, is accelerating faster than ever before. Investment in medical research provides immense HOPE to the scleroderma patient, which, when living with an incurable diagnosis, is the next best thing to the cause and cure being discovered. Hope has been my constant companion of the last 19 years, along with the inspiration and comfort taken from being a patient of one of the world’s leading scleroderma pioneer medics, Prof Chris Denton. At the 4th Systemic Sclerosis World Congress held in February 2016, in Lisbon- The Journal of Scleroderma and Related Disorders (JSRD) was launched. The JSRD is dedicated solely to scleroderma and its overlap disorders. The presence of this respected medical journal on the world stage provides hope to patients, by way of showing the current ongoing, actual medical research results and investment into such. Including, the approaches being utilised to endeavour to shine the desperately needed light on improving scleroderma patient treatments and care. To date there are 3 genes associated with scleroderma susceptibility that are located on the X chromosome - IRAK1, FOXP3, MECP2. IRAK1, FOXP3, are vital for T cell function and MECP2 is associated with DNA methylation’. This is most certainly a fantastic advancement in the understanding of the scleroderma process. And certainly, extremely thought provoking, as the statistics show the incidence of scleroderma to be higher in females than males. During my 19 year patient experience, I have taken part in numerous clinical trials for medical research. I see this participatory opportunity as a duty, as well as a pleasure. A duty, as I hope to be able to help future scleroderma generations by utilising my body for medical research. I am extremely grateful to all of those scleroderma patients who assisted in medical research which has enabled the long term outlook of living with a scleroderma diagnosis more favourable than ever before, in the event that an early diagnosis has prevented irreversible internal damage. In my view, to take part in a clinical trial is a fantastic opportunity, to not only have the possibility of taking a potential improved treatment for scleroderma, which has been under years of scrutiny prior to even making it to the clinical trial arena for humans, but also, to have a thorough assessment and examination with novel techniques and experimental processes which may not be included in the normal course of events for purposes of a regular standard monitoring appointment. 2. The Scleroderma Patient Centered Intervention Network (SPIN). I have participated in SPIN questionnaires online, for a few years now, for purposes of research. I think that the ongoing SPIN research is a fantastic tool for providing understanding into the holistic approach to treating and responding to scleroderma. All in all, an investment in global medical research is essential for the scleroderma patient. The time taken for the newer biologic innovative medicines to reach the market place needs to be reduced, as does the access to these medicines, which have shown to have a remarkable improvement in disease progression and severity. Time is a luxury for the scleroderma patient and the rare disease patient alike. Medical research is making improvements, however, patients are quite literally ‘dying for a cure’. 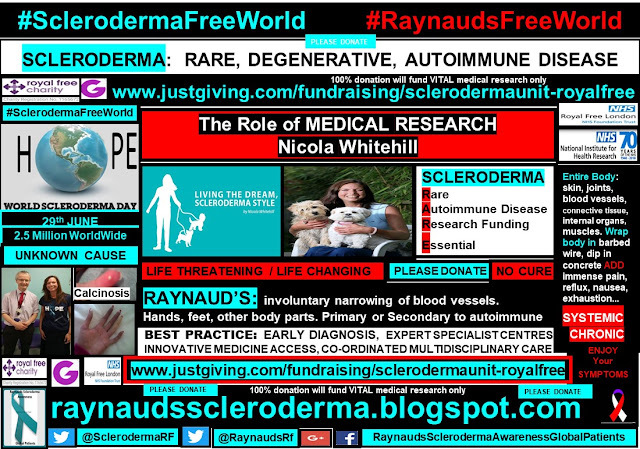 I am grateful that I am still around to be a scleroderma patient, in the hope that, investment and commitment to accelerate medical research will instigate the light bulb moment needed for a #SclerodermaFreeWorld’ and #RaynaudsFreeWorld' – imagine that! And, in the meantime I will continue to ‘Live the dream, Scleroderma Style’, with Hope, remaining as my best friend and companion.